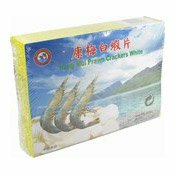 Prepared from superior starch, prawn flavouring, refined salt and sugar. Brotherhood brand crackers are noted for their unique flavour and crispness, fit for both festive boards and homely meals, or to be presented as gifts to friends. Preparation: Fry the crackers in boiling vegetable oil at 220 Degree C. Done when floating. 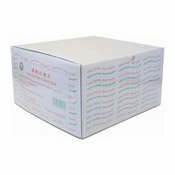 Ingredients: Corn Starch, Water, Prawn Extract (Crustacean) (8%), Sugar, Salt. 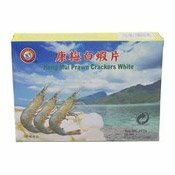 Simply enter your details below and we will send you an e-mail when “Hong Mui Prawn Crackers White (兄弟康梅白蝦片)” is back in stock!